Positions often directly or indirectly attributed to WikiLeaks are in fact misrepresentations. For instance, WikiLeaks do not have “anti-Sweden” or “misogynist” positions whatsoever, and neither have such postures authors that have been cited, linked, or tweeted by WikiLeaks or Sweden Versus Assange. *Professor emeritus of Public-Health Epidemiology; former Professor of Psychosocial Methods. Submitted the Witness statement on the Swedish Trial by Media of Julian Assange upon the London court 2010. The purpose of this article – the first is a series of three – is to set the facts straight about some important topics regarding WikiLeaks and the media. One is how to properly assess the conflict between certain media hostile to WikiLeaks and Julian Assange; in my view, WikiLeaks and Assange have only tried to respond to such attacks; namely they are not the “aggressors”. Another topic is about the different roles of WikiLeaks regarding the Internet publishing of whistleblowing material and the interacting in the social media. Professor Christian Christensen might have misunderstood these different roles, concepts he has not limited to academia but further spread in the Internet and the social media via his blog and Twitter. Christensen has also publicly endorsed twittering criticizing Julian Assange’s talk show, “The World Tomorrow” for not including women in any of the first interviews with leading revolutionary or intellectually significant figures. But, would it not be more logical to wait for such assessments until the full schedule of interviews is completed? Formally, because it is up to WikiLeaks editors to decide both what to make public in disseminating information at their official sites and with whom and how to interact in their Twitter account; and also because it is erroneous to equate different modes in the societal interaction of WikiLeaks. In content, because positions directly or indirectly attributed to WikiLeaks by Professor Christensen in such issues as, for instance, “feminism”, “radical feminism” and the like, are in fact misrepresentations. In clear words: WikiLeaks do not have “misogynist” positions whatsoever, and neither have such postures – to the best of my knowledge – authors that have been cited, linked, or tweeted by WikiLeaks or Sweden Versus Assange. In the core of the matter, what has been problematized here, or intended to be debated by such criticism, is an issue of consequence: Whether the different statements by WikiLeaks are or not consensual with basic Human Rights values implicit in their main whistleblowing endeavour: the contribution to justice, to equality (including of course gender equality as well as social and economic equal opportunities) and respect for human dignity; and the positioning of the integrity of individuals in societies as paramount to “secret” State interests, egoist interests of the rulers or corporate interests. 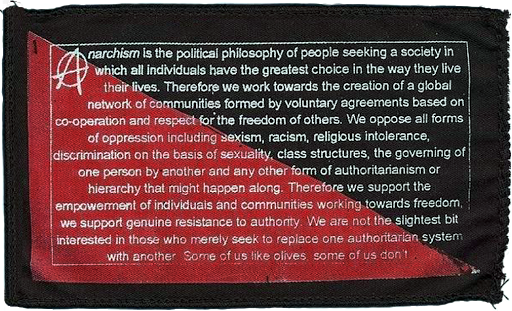 In other words – in my interpretation – a political philosophy of liberation, democracy, and human rights development. And in this core of the matter is where the equivocal interpretation spread, for instance, by Christensen shows itself emphatically. 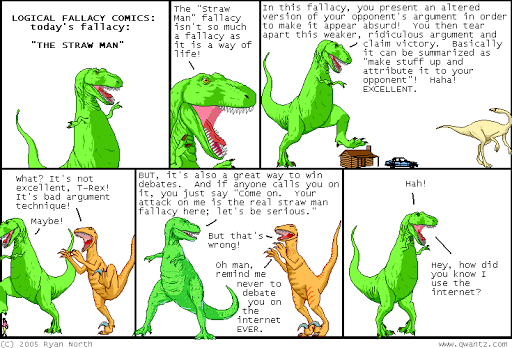 Namely, it is in any case incorrect or “straw man” fallacious to attribute to WikiLeaks (the organization), its founder and editor, or deputy editors and staff, etc., the opinion expressed by WikiLeaks supporters, irrespective of whether these opinions are or are not congruent with WikiLeaks fundamental principles. The one who wishes to establish what posture WikiLeaks has on issues, should be restricted to WikiLeaks own statements. Christensen is professor of media and communication studies and in his personal presentation at the Uppsala University directory, he describes his primary special area being the “use of social media during times of war”. 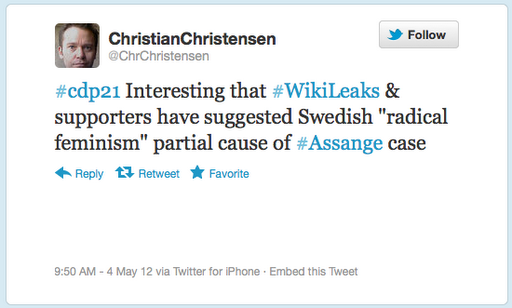 In this war that NATO and their proxy, the conservative right-wing government of Sweden, wages against WikiLeaks, Professor Christensen has publicly requested WikiLeaks – without any argument whatsoever – to filter away in its twittering the linking to certain articles describing important actors in the Swedish political context of such attacks. Internationally, Uppsala University enjoys a solid reputation, and too in Sweden regarding the university’s ground research, natural and medical sciences. On the other hand, no wonder Uppsala University is one Swedish academic institution whose reputation or academic standards in certain domain of “qualitative-research oriented” social sciences – specifically “gender studies” has been most severely questioned by prominent professors in Sweden in the last decade. Partly for its vassal position towards government — particularly the sacrificing of scientific research on behalf of extreme “feminist” political positioning directly imposed by Ministerial rule; partly for completely disregard for external investigations on scientific or academic misconduct related to such research. That was the case of the creation at the government’s request (not at initiative form the University) of a professorship on radical “gender studies” for the Christian theology researcher and extremist “feminist” Eva Lundgren. The post was created “from above” with special marked public funds,  engineered at the time the radical feminist Minister Margareta Winberg – in fact Sweden’s Vice Prime Minister – was in the government. Winberg had made approve at the government – without opposition, according to her –  the compulsory “gender perspective” in all levels if education an research [See Part II, Swedish version of “State feminism”]. Christensen did not refer any article in particular, and was thereafter demanded by @SwedenVSAssange and other twitters to specify the articles about “radical feminism nonsense” he was referring to. Christensen never complied. Why would the anti-Assange/WikiLeaks people that started such disinformation campaign wish to “switch off” particular voices at the public forums if it were so that such analysis would be harmful to WikiLeaks? Perhaps because the truth might be exactly the opposite; At least judging for the massive response from Assange supporters towards the Professors blogg. Geopolitical factors — the threat represented by WikiLeaks to political/military interventions elsewhere in the Third World that secure corporative interest; This “menacing” role of WikiLeaks is symbolized by the exposure of war atrocities in Collateral Damage. And Sweden is directly intervening with troops in such imperialistic occupation wars. The role of the Swedish vassal government has not only been supporting such operations militarily, but plays a pivotal political role in Europe in advocating for the increase of such support on behalf of the European nations. Sweden has in fact launched a “NATO by Proxy” doctrine (See “The NATO factor. Extradition process initiated in Sweden against the WikiLeaks founder is to the uppermost extent POLITICAL“,  aimed to motivate an increasing sharing of the NATO burden by the rest of European countries. The linking VS not-linking to Professors blogg. Who is afraid of what? Now Professor Christensen – a specialist in social media – started his own series of twittering criticizing WikiLeaks for linking “nonsense anti radical feminist” materials. As mentioned above, what are the articles he referring to he will not say, despite having been asked multiple times, directly on this issue, by @swedenvsassange, and by @helenebergman and @treisiroon. Observers to the exchanges on Twitter also mentioned that they await Professor Christensen’s answer. 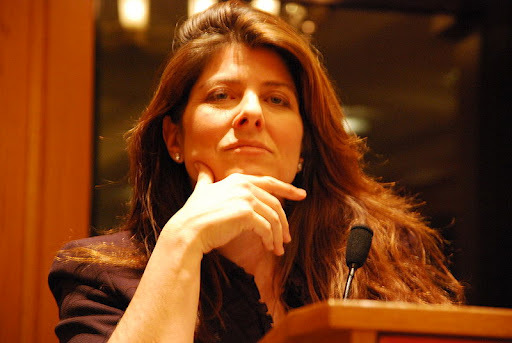 Only recently, however, he did mention a study by Al Burke that contained references to or by notable Swedish authors Helene Bergman and Brita Sundberg-Weitman – both supporters of the cause of justice for Julian Assange. WikiLeaks answering the attacks by the media; not vice versa. And: Is radical “feminism” a part in the constellation of political factors explaining the political offensive and media attacks against WikiLeaks and Assange? 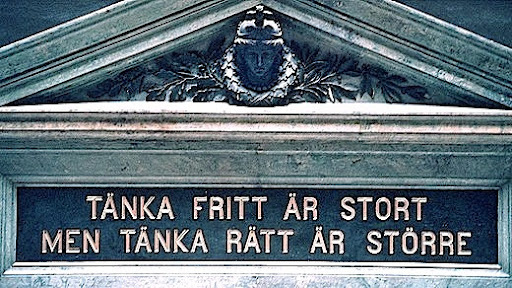 State-feminism in Sweden, does it exist? Christian Christensen, in his rebuttal to my article here (see down below “Christian Christensen vs. WikiLeaks”) deceivingly refers my position on Swedish radical “feminism” by expressly picking up for his readers only one link among the variety of articles in which I have developed the issues he tries to rebut. In this update I include excerpts I have published in other analyses here in the Professors blogg on the issue radical “feminism”. As an addenda to my article Christian Christensen vs WikiLeaks I would like here to point out that Christensen is not only confounding political organization with political ideology (see twitter 1 below); he is also confusing “cause” (or “partial cause”) with “contributing factor” (twitter 2). In science, at least in Epidemiology, phenomena are used to be described as having a multi-causal etiology. Yet “cause” is not “factor”. Margareta Hallberg and Jörgen Hermansson, “Granskning av professor Eva Lundgrens forskning I enlighet med Uppsala universitets regler avseende förfarandet vid anklagelse om vetenskaplig ohederlighet”. 9/12, 2005. R Poirier M “it would be nice if we are keeping away from see that it spreads in the Swedish blogosphere” [“det vore trevligt om vi slapp se den spridas i den svenska bloggosfären”]. See Rixstep article “Guardian Censoring Information in Assange Case” reports on censorship exercised in The Guardian against links to Professors blogg. Wikileaks Central had reported likewise (see “Possible gag order on the Guardian re Assange case?). ← Only "Ethnic Swedes" Relevant For PM Reinfeldt?